If you’re considering using this service, you’ll be pleased to know that they pay in good old pounds sterling, and not in US dollars. Just for the avoidance of doubt! This firm is one of the lesser-known names in the cash-for-phones market, but seems to come up top when we use our mobile phone comparison tool – they tend to be offering more money than many of the more common names in the market, such as Envirofone and Mazuma. 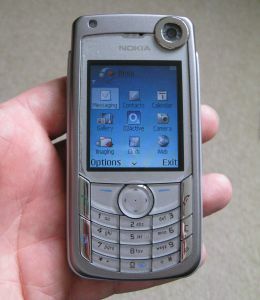 For our test, we’re parting with an old faithful… an old Symbian OS phone, the Nokia 6680. 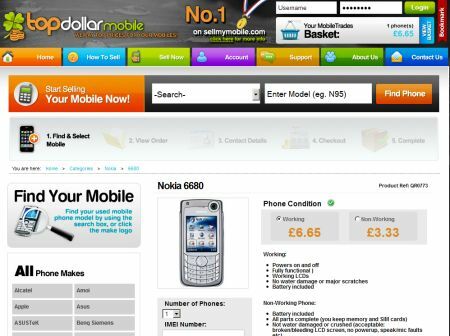 Putting in the make and model on the Top Dollar Phone site was easy, and we were quoted £6.65, which at the time of writing was the best price for this phone. Once we’d put in the make and model, we were asked for the phone’s serial number (the IMEI). We were next asked to add our name, address and contact details, with the option to add a password for repeat visits. Next, we were told that we could get our payment by cheque, or by an electronic BACS payment to our bank account. Unlike the other companies we’ve tested, we note that payment by cheque incurs a £1 fee, meaning that electronic payment is a better bet to get the maximum payout. Once we entered our bank account details and finished the transaction, we were expecting to see details of how to get the phone sent back. Instead, we got a message telling us to expect an email with further instructions once our transaction has been approved. In the end, we didn’t get an email, but within two days, we got a package, containing an envelope to the return the phone in, plus a leaflet with instructions. The envelope was platic, and only lightly padded. The guidance in the leaflet is to “wrap delicate handset screen with bubble or tissue. We popped ours into a small Jiffy back, just to be safe. The envelope is a Freepost one. Our mobile was sent odff via our local Post Office, and for safekeeping, we got a Certificate of Posting. By the next working day, we’d got an “Order Update” email, confirming receipt. The payment of £6.65 arrived in our bank account four working days later. The transaction with Top Dollar mobile went very smoothly, and we’re happy with the outcome. Happy to recommend their service. Any experiences to share? Please comment below. I have sold 3 phones to TopDollar and would highly recommend them. fast efficient service and in each case the phone was sold for more than any othr site was offering. In 2 cases by as much as £10 pounds. For some reason none of the comparison sites I have looked at quoted TopDollar. 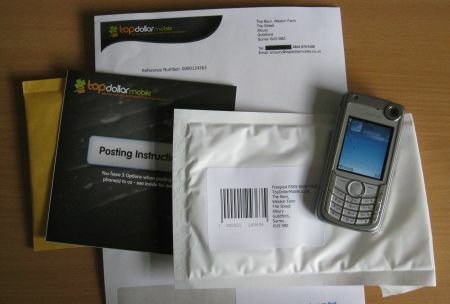 If you are going to sell your phone try a comparison site then check what TopDollar are offering. I have just sold my mobile through Top Dollar Mobile, I have used other companies previously but on this occasion they were offering more than £10 above the next top quote I could find. I did wonder if it was too good to be true but decided to risk it. However to my delight the full quoted £35.50 has just arrived in my bank account so I’m a very happy customer! I googled top dollar and compared their prices to other companies. They were the best. I decided to give them a go….WOW!! smooth and efficient. If you want to sell your mobile…look no further. Beware if you are sending them a iphone that is locked to a carrier as they will deduct at least £30 from the price quoted when you submit your order. They are also slow in coming back to you had to chase them several times for an update.